Swimming in Switzerland can be a year round event. Now, you won’t find me in the middle of winter swimming in the lakes, but you will find me visiting one of the numerous thermal baths dotted all over the country. However, the thermal baths are not to be just saved for winter, Laura from “Let’s Explore” discovered the Thermal bath - Brigerbad - on a recent holiday in the southern Swiss canton of Wallis, and this place is heaven for kids on a warm summers day. Brigerbad is a thermal bath and it’s open daily, all year round, from 9:00 AM to 8:00 PM. The family rate is CHF 15 for adults and CHF 11 for children, or 52chf for a family of 4 for a 3 hour visit. More expensive than a normal public pool, but definitely worth it! Journey by car to Brigerbad (approx. 2 hours from Bern) and park for free at the onsite parking or travel by public transport by taking a train to Brig or Visp and then a PostAuto to Brigerbad. Definitely the slide that comes right off the mountain, I’ve never seen this before! It’s the longest Alpine slide in Europe (182 meters). Totally loved it! Brigerbad has something for every age. In summer they have a nice wading pool outside for the little ones in the shade, and in the inside pool area (so also in winter) they have a kids pool with toys floating around that the little ones can play with. 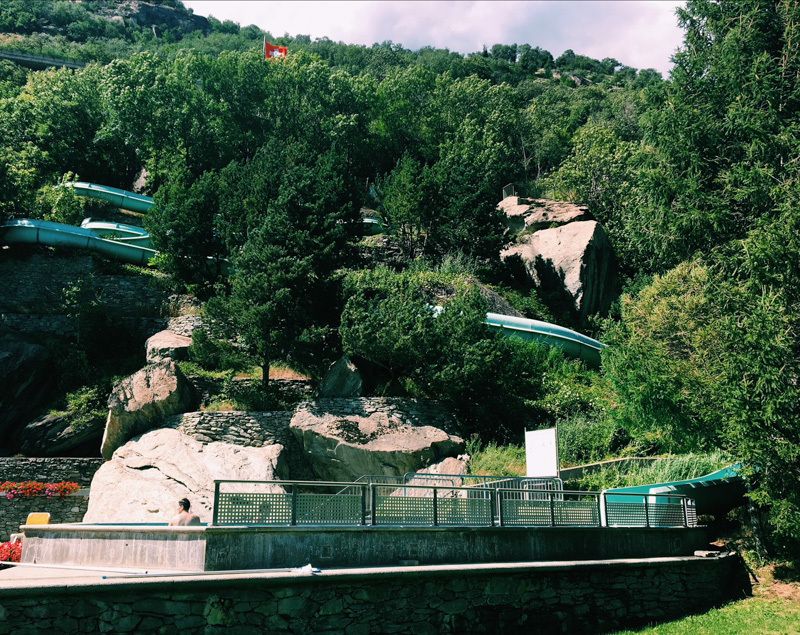 In summer, there is a river with current which all ages can enjoy with their parents, a bouncy castle in a part of the Olympic sized pool, and, rocks to climb up on and jump off of!! There’s two different sizes of rocks, a lower one for the younger kids and a higher one for the daredevils! Our kids loved the thrill of jumping off! Just outside of Brigerbad there is a campsite which is open from May until October. There is a restaurant which serves tapas, and the menu has a focus on specialties from the Wallis region. There is also a take-away restaurant where you can order pizza, hotdogs and burgers. Glasses and goggles… I personally cannot do without my sunglasses, even on cloudy days. I even swim with my sunglasses on… Swim goggles for my kids… It’s the first thing they ask for when we arrive. I am originally from the Netherlands and I’m married to my French-Swiss husband. We have two boys and we live close to Geneva. I have a passion for travelling, cultures and languages and love to share these passions with my family. I’ve created my family travel blog "Let's Explore", where you will be able to find cool family travel tips, but also recipes shared by locals from different countries, an article series I’m particularly excited about as it really makes me ‘get to know’ people through their food. Thanks to this series my family and I have already ‘virtually’ travelled to several countries from different continents by eating their food and dreaming about that location! Thanks Laura for sharing with us your new discovery! If your favourite place to swim in Switzerland has yet to be shared, make sure you head over to the “My Badi” page, scroll to the bottom and fill out the easy to answer questions. We would love to feature your location!